The flight to Amsterdam was pleasant. We sat near the back of the Airbus A330. Each seat had their own multimedia system. We had a choice of languages, and movies, music, games, or we could watch a world map with a graphic of a plane showing our position and direction. I watched Slumdog Millionaire, it was very good. After that I listened to music and tried to nap, though did not do a very good job of it. My daughter watched the same movie, then a familiar Hercules, then a lot of Australia. They fed us a couple times, too. Many others had trouble sleeping, we arrived a little earlier than our scheduled 6:30 AM, in other words 12:30 AM Des Moines time. There was one girl who, as we were waiting to de-plane, announced that she was well rested, as she took some Nyquil or something. This just before she fainted. It was a little stuffy at the back of the plane, and apparently she had not been moving enough to get blood moving very well. She woke up soon after and was assisted by adults nearby and was ok. The Dutch can be very thorough with following procedures, so we had 90 people to get through getting boarding passes and immigration. Luckily some of the group was for a later plane, since the first group barely all made it in time for our flight. They managed to feed us some sandwiches on the 45 minute flight to Paris, on some very good multigrain rolls. I got a marmalade and an omelet sandwich. Some others got goat cheese and some kind of berry, I think. The air was very foggy, so we barely emerged from the clouds before landing. One of the boys noticed right off that all the cars were smaller, and most of them were French Renaults, Citroens, and Peugeots. The Paris airport reminded me of a giant habitrail (a kind of cage for hamsters or gerbils). Since we went through customs in Amsterdam, we just had to get our baggage and find our tour operators. On our way, one security guard, (who looked part African) told me in broken English that he was very happy about Obama and that I should run for president. I told him “C'est trop tard pour moi!” (Its too late for me) but he assured me that anything was possible. Another airport worker took pictures of my daughter and friends next to a sign that indicated that they were in the Paris airport. He happened to come by me as I was looking at a rack of maps and asked me if I spoke French? I said that I did a little, and he was so happy, he gave me a stack of maps to distribute. We loaded our stuff on our bus then went off to restrooms and whatever while waiting for the other flight. I went with the tour guides to practice my French and help connect them with the other group. Out tour guide, Patrick, told us about the sights as we were passing. I took pictures of some trains for my son. We passed a lot of high rise apartments crowded together on the edge of town. I noticed a bunch of small gardens that looked like they were for different people. Unfortunately I did not get a picture. I confirmed later that people would lease a small space so they could have a garden even if they lived in those apartments. I saw these in other towns outside Paris as well. There was some light drizzle on our way out of Paris. The roads were fairly crowded, even though it was late on a Thursday morning. I noticed very early that motorcycles and scooters seemed to have a lane just on the dashed line to the right of the far left lane. The seemed so consistent that it must be a standard practice. The cars in the far left lane would stay to their left, the cars in the next lane over would stay to their right, and two wheelers would zoom through. This would turn out to be more pronounced when we got back to Paris when traffic was tight. Most of the cars were of the 4 seat hatchback variety, as if their trunks had been cut off. A Mini-Cooper would be an average size car. A VW Golf would be on the larger side, but similar style. On the road to Caen we passed a few car carriers full of Renault Clio cars. I also noticed a very large number of what I would call a hybrid between a car and a panel van. I cannot think of anything sold in America like them. They are smaller than a Chrysler PT Cruiser or Chevrolet HHR, two seats with cargo behind. There are examples in several pictures on different days. They were made by Renault, Citroen and european Ford at least, but you had to be close up to tell the difference. Most of the rest of the people on the bus took a snooze not long after we left Paris. I did not want to miss anything, so would only close my eyes for a couple minutes at a time. Not far from Paris, I began to see forests that looked like there had been logging. Not the clear-cut way we may see in the U.S., but there were stacks of logs, all seemed to be cut about 1.5-2 meters. It seemed like a very odd size, until I saw a fireplace in one of the palaces took logs about that size. I did not get any pictures, since I was afraid that we were moving so fast the trees close by would blur. On the way back to Paris I was asleep during that part so did not get to ask. As we got farther out in the country, the little villages became littler and farther between. Most seemed to be made out of the same small houses, and I could usually see some old church. The water towers looked odd, like they had their tops cut off. I am sure there is some reason, but I never got to find out. I did get at least one picture of a village with some old style houses, some modern office type buildings, and one of those odd water towers. I began to notice that we seemed to be in a wide, flat valley, with hills in the distance. I suppose we were in the Seine river valley. I was struck by the large fields of what appeared to be grass, or even sod. Our tour guide mentioned that there are a large number of dairy farms in Normandy, and that the cows were beautiful and happy. It may have been my imagination, but the cows in each pasture seemed to be a different breed, or at least different color from the pasture before. The cow pastures were as green, but not as smooth, as the fields I continued to see. There were other types of fields, but it was too early in the season to tell what was there. Sometime after 1 PM local time (7 AM Des Moines time) about 2/3 of the way to Caen, we stopped at a rest stop for lunch. The place has some grocery items and a deli/bakery. I had some kind of ham and cheese on a small baguette that was very hearty and then I helped translate what the choices were for some of the group. There were two buses and about 90 customers. After the line went down I also got a lime flan that was wonderful. As we left the rest stop, there were a large number of seagulls in a nearby field and in the air. A sure sign that we were getting near the ocean. As we drove along, I began to notice trees that seemed to have all the branches cut off. I did not think too much of it at the time, but when I got to Caen, I noticed much larger examples. 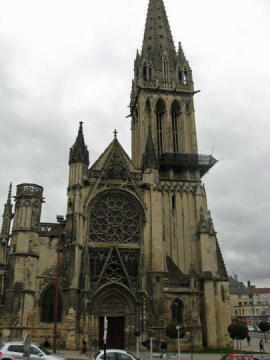 We arrived in Caen at about 2PM local time. We stayed at the Hotel Holiday Inn City Centre. In France, they call the ground floor 0, and 2nd floor 1st and so on. My room was on the “2nd” floor, looking through the flags over the little traffic circle. To my left was the horsetrack. On the right side of my view was the stand of rental bicycles. Apparently one could pop in some coins and take off on one of them, then turn it in at any other similar stand. The room was modest, with two twin sized beds, a bathroom, and a closet big enough to hold maybe two coats, certainly not my suitcase. Under the hairdryer was a combination 110/220V outlet with a label indicating it was for shavers only. I bet an Ipod charger would work as well. My daughter was on the “4th” floor. Her bathroom had only a part shower door. I think the idea is to use the hose, but she could not understand why it did not have a full door. My bath had a shower curtain, though all the rooms in Paris had the small doors. I realized that the camera was still on Des Moines time and reset it before leaving my room. 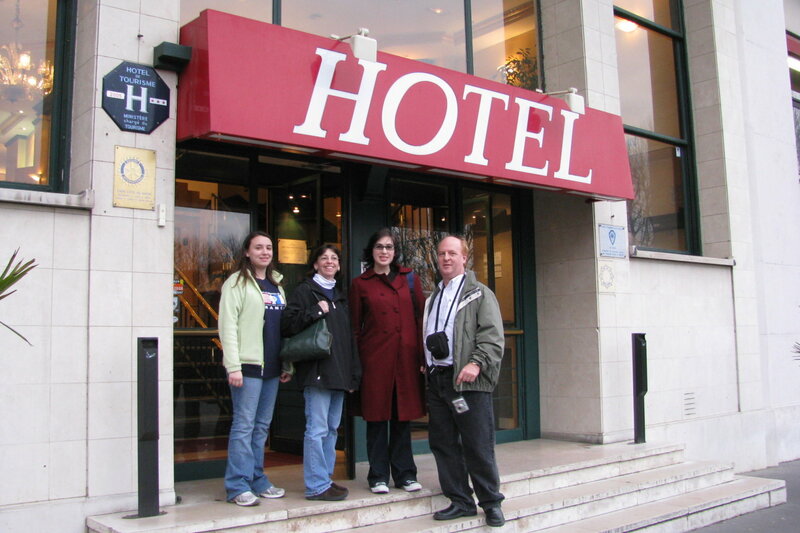 After some rest, a few of us set out on a little walking tour of Caen. We had a map and some vague directions about where to go. I felt more confident than some of the others about reading the map, so helped decide directions to make our way over to the Chateau. This part of Caen had wide sidewalks and narrow streets. I saw some more of the trees with all the branches cut off. This time they were much bigger and seemed to make more sense. In other areas, the narrow shoots were trimmed in to giant hedge shape. A couple days later our guide would tell us what kind of tree they were and that France was famous for them, but I did not get to write down what they were, just marvel at their alien nature. After looking at some shops, we came up to an old church that turned out to be St. Pierre. At this point, some of the group headed back to shopping or whatever, and some of us pushed on to the chateau. We walked past the trolley, left St. Pierre behind us and worked our way up to the South side of the Chateau. It must have been something 700 years ago. Today, it is just some old ruins where tourists like us can take cool pictures. Looking out over the city, it seemed like there were churches everywhere. There were over a dozen on the map. The museum was closed, so we only took pictures of some of the sculptures. It was starting to get late, so we started heading back to the hotel, and got there less than an hour and a half after we left, with plenty of time for dinner. With the jet lag, and all that happened after that, I forgot what we had to eat, only that there were several courses and it was very good. One of the other chaperons thought that the appetizer was dinner.